It had been almost a year since my last Instagram post. After graduating college in May 2015, I moved to Atlanta in August to start a year with the Episcopal Service Corps. Through this program of communal living and social activism, my world was expanding, my ideas were challenged and I was constantly growing. 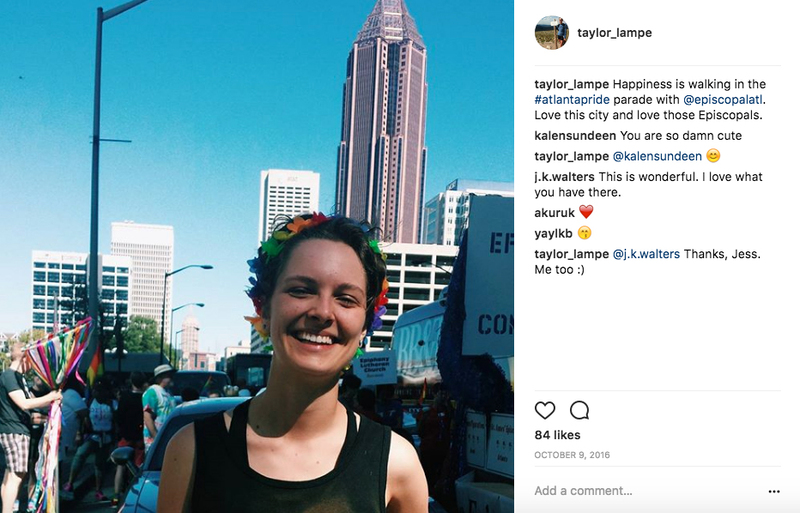 Five Instagram posts into my time in Atlanta, I knew that photos would never be able to capture the intense, beautiful and extremely meaningful things that were happening. After a final post on October 26, 2015, I went silent. For the most important year of my life so far, I was completely absent on Instagram — perhaps the most impactful social media platform of our generation. I didn’t know how to capture life in a way that felt true, that wouldn’t minimize it. I hated the idea of people only understanding pieces of my experience, but I also hated the loneliness I felt in experiencing something so significant without knowing how to share it. During this time, I also began settling into my queer identity. Even though I was out to close friends and family back home in Indiana, feelings of fear and shame had kept me from living into my identity, or sharing it beyond my close community. When I came to Atlanta, I vowed to stop hiding. I vowed to be “out” from the start. So, I started meeting LGBTQ people, attending queer events and dating. It was glorious and liberating in ways that I never imagined. On October 9, 2016, after my first year in the Episcopal Service Corps, I attended my second Atlanta Pride parade and had the opportunity to walk with the Episcopal Diocese of Atlanta. Right before the route began, a friend snapped a photo of me. Wearing a rainbow luau on my head and a tongue-in-cheek homemade shirt proclaiming “God Save the Queers,” I looked giddy with joy and wholeness. After the photo was taken, I acquired a gay flag to drape around my shoulders, and I was ready. I was in the front of the Episcopal section, and was first to see the looks of joy, hear the cheers of celebration and watch the crowd revel in a church participating in the parade. A rush of emotions coursed through me the entire route. It felt like freedom. When we finally entered Piedmont Park, I was walking on cloud nine. I decided, somewhat suddenly, that I wanted to post on Instagram. I was so happy, and in that moment, my happiness was something that felt uncomplicated, pure, easy to convey via social media. It felt like something my friends and family would be glad to see, and could understand, even as I still felt like so much of my Atlanta life eluded even my best attempts at explanation. But, I quickly ran into a challenge. I wasn’t publicly out. It was almost easy to forget that small, but important, detail. Vowing to enter Atlanta fully “out” had totally altered my day-to-day life. I censored myself less, even with loved ones back in Indiana. I was newly open in ways that affected my posture, my relationships, my laughter. But, I was still keeping my queerness under wraps on social media until I felt ready to make it public. As I stood there in the pulsing crowds of Pride, I faced a sudden and crushing dilemma. Here I had a picture of myself that I really wanted to share. But, if I did so, the picture would raise some strong questions that I wasn’t quite ready to face. The shirt specifically felt risky — I had never used the word “queer” before online. I realized that the only way to share this photo on Instagram without implicitly outing myself would be to crop out the shirt and write a caption that could have easily been written by an ally. And yet, I was happy… still giddy and still happy. I wanted to share that. After many minutes of strategically cropping the photo and crafting the caption, I posted my safe, edited version on Instagram. As likes and comments started coming in, suddenly, unexpectedly, I had a strong urge to delete the photo. I still felt exposed. Even as I hated censoring my queerness, the fear of sharing pieces of my truth was stronger. What if someone suspected from the Instagram? After that post, I started regularly sharing on Instagram again. I had begun to accept the limitations of social media, and I knew that Instagram posts could never fully convey life’s complexity. And yet, I still found that my posts felt incomplete — but in a different way than before. Now, by leaving out a huge part of my identity, I was willfully limiting what made it onto my feed. To my surprise, this felt almost more painful than what I had experienced after first arriving in Atlanta. Five months later, I decided to come out publicly on Facebook and Instagram. I can’t say clearly what forces conspired to bring me to that point, but I was tired of censoring what I posted and thinking about who knew or didn’t. I was ready to be a more visible and vocal member of the LGBTQ community. Timing worked out perfectly, and I did an interview with a friend for her new blog project on life and love in the LGBTQ community. This avenue meant I wouldn’t have to craft the words entirely on my own: I could talk about the integration of my queer identity with the many other facets of my life, and hopefully, my words could reach beyond just my community and social media followers. The support was overwhelming, and this new phase of liberation has been incredible. I can post whatever I want! My uncertainty and discomfort with Instagram will never go away — every post reminds me that most of our “truth” is too complex to convey fully, no matter the medium. But, I am posting. And I will never, ever crop out my queerness again. Taylor Lampe recently moved to New York City to pursue a master of public health. She is still learning not to smile at strangers on the train.